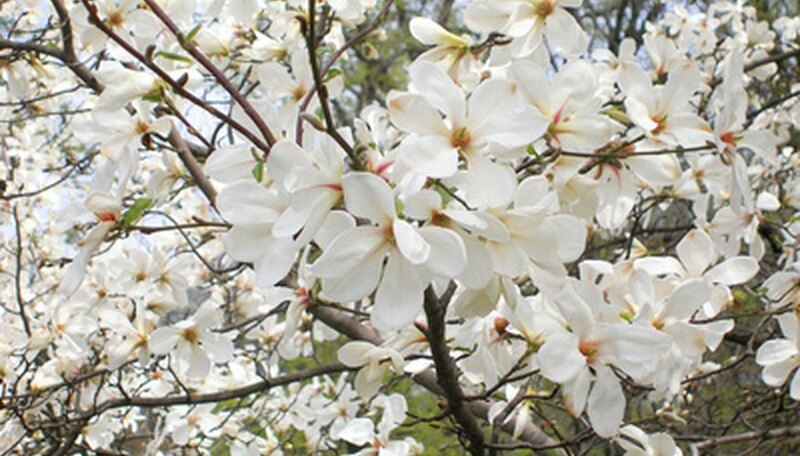 Many of the native trees of Mississippi bloom with white flowers in the spring and summer. In addition to attractive blooms and silhouettes, these native species offer food and shelter for wildlife and often require little attention from gardeners. Planting native flowering trees in your garden also reduces the spread of invasive non-native species. Southern magnolia, or magnolia grandiflora, is an evergreen tree that grows up to 100 feet tall. Large flowers, up to 10 inches wide, bloom in the spring and red seeds appear in the summer. Glossy, 4 to 8-inch leaves grow along the branches. Southern magnolia prefers moist, rich, slightly acidic or neutral soil. If planted in alkaline soil, the leaves of this tree may turn yellow. If pruning is desired, do so only after flowering has ceased. The deciduous tree known as parsley hawthorn, or Crataegus marshallii, grows wild in moist woodlands and along stream banks. Multiple trunks with exfoliating bark reach up to 30 feet in height. Clusters of dainty white flowers bloom in early spring and red fruit appears in late summer, often attracting birds. The parsley-like foliage turns yellow or red in the fall. Plant parsley hawthorn in partial to full sun and well-drained, moist, poor soil. Providing rich soil and fertilization can lead to outbreaks of fire blight, a serious bacterial disease that damages buds, twigs and foliage of infected hawthorns. Cyrilla racemiflora, commonly known as titi, grows up to 30 feet tall and 15 feet wide. This semi-evergreen grows wild in wetlands and swamps. It features twisted branches and dark green, glossy leaves that may turn red or orange in the fall. In May and June, fragrant, dangling flowers bloom and brown seeds remain on the tree throughout the year. Plant titi in full to partial sun and wet, acidic, rich soil. Found along streams and in woodlands throughout the southeastern United States, silverbell or Halesia diptera, reaches up to 35 feet tall. This deciduous understory tree blooms with bell-shaped flowers just after the emergence of the medium green, pointed leaves. Green seedpods with two wings appear in summer and the leaves often turn yellow in the fall. Provide silverbell with partial sun or shade and moist soil. The multiple trunks of cherry laurel, or Prunus caroliniana, grow upright, forming an oval canopy that reaches up to 30 feet tall. In early spring, small, creamy flowers bloom among the glossy, dark green foliage. Black fruits follow the flowers and last through the fall. Native to sandy streams, this evergreen prefers well-drained soil and tolerates wind, heat and drought. Plant cherry laurel in sun or partial shade for best flowering results.